A very popular landscaping plant Trachelospermum jasminoides is commonly called ‘Star Jasmine’ or ‘Chinese Star Jasmine’. Offered by wholesale growers in range of sizes from tube stock to larger specimens reaching around 1m in height, ready to make an impact in any landscaping scheme. This is climbing evergreen plant with fragrant white flowers and glossy green foliage. A variegated form is also available. Grown for the starry white flowers ‘Star Jasmine’ is used both as a climbing plant as well as a ground cover. These plants can also be grown a shrub or hedge if they are pruned regularly to maintain shape and size. Used in the home garden as well as commercial landscaping projects it is sold by wholesalers in sizes ranging from tube stock through to more advanced plants in 200mm pots. Excellent as a potted specimen on a balcony or terrace as it has low to moderate water requirements. It also flowers in full sun to part shade which adds to the versatility. 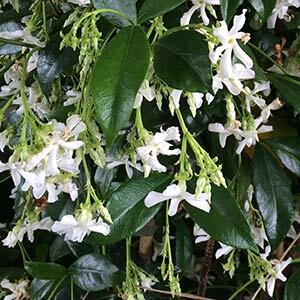 Trachelospermum jasminoides – The Star Jasmine is available from the following wholesalers.